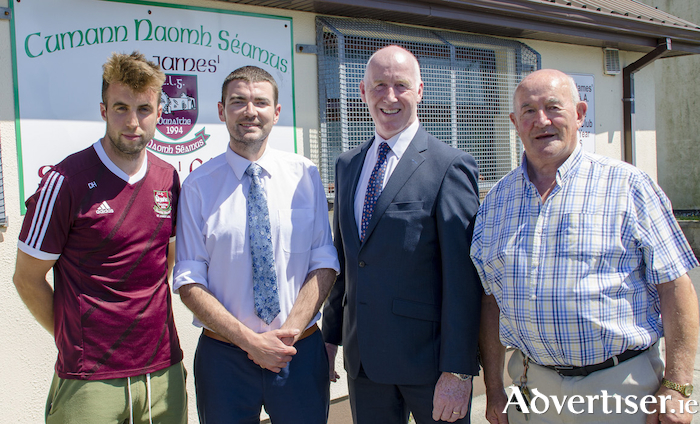 Pictured from left to right are: Paul Conroy, St James, and Galway senior footballer; Minister of State for Tourism and Sport, Brendan Griffin; Cllr John Walsh; and Con O'Donovan, St James GAA. €40 million in funding is being made available by the Government under a new round of the Sports Capital Programme 2018, and sports clubs, schools, and communities in Galway are being urged to apply. The aim of the programme is to provide support to clubs and organisations to develop sports infrastructure in their areas. St James GAA, Mervue Utd AFC, Renmore AFC, and the Liam Mellows and Castlegar hurling clubs, have previously benefited from the Sports Capital Fund. For the 2018 scheme, greater priority will be given to applications from disadvantaged areas and projects that promote the sharing of facilities with other clubs in the community. Interested clubs, schools, and community groups, can register and applications can be made at www.sportscapitalprogramme.ie from 9am on Friday September 7 to 5pm on Friday October 19. Fine Gael TD Hildegarde Naughton and FG city councillor John Walsh are encouraging groups to apply for the funding. “Following a thoroughly enjoyable sporting summer I would encourage all organisations with suitable projects to apply," said Cllr Walsh. Dep Naughton pointed out that under the programme, which was recently revised, schools are now eligible to apply for funding under the programme, provided they do so in conjunction with a sports club. She said: "I hope a large number of Galway schools will see this as a great opportunity." Galway - welcome to Varadkar country? Page generated in 0.1808 seconds.